We used a saying by Mahatma Gandhi for our example of a message widget. He also said: "My life is my message." "The police" sent an SOS to the world in a bottle and they hoped that someone gets their message in a bottle. We recommend using Python and Tkinter and the internet, because it will be definitely more efficient. The widget can be used to display short text messages. The message widget is similar in its functionality to the Label widget, but it is more flexible in displaying text, e.g. the font can be changed while the Label widget can only display text in a single font. 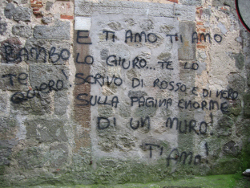 It provides a multiline object, that is the text may span more than one line. The text is automatically broken into lines and justified. We were ambiguous, when we said, that the font of the message widget can be changed. This means that we can choose arbitrarily a font for one widget, but the text of this widget will be rendered solely in this font. This means that we can't change the font within a widget. So it's not possible to have a text in more than one font. If you need to display text in multiple fonts, we suggest to use a Text widget. 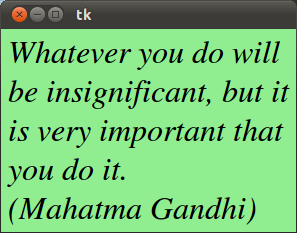 whatever_you_do = "Whatever you do will be insignificant, but it is very important that you do it.\n(Mahatma Gandhi)"
anchor The position, where the text should be placed in the message widget: N, NE, E, SE, S, SW, W, NW, or CENTER. The Default is CENTER. aspect Aspect ratio, given as the width/height relation in percent. The default is 150, which means that the message will be 50% wider than it is high. Note that if the width is explicitly set, this option is ignored. background The background color of the message widget. The default value is system specific. borderwidth Border width. Default value is 2.
cursor Defines the kind of cursor to show when the mouse is moved over the message widget. By default the standard cursor is used. font Message font. The default value is system specific. foreground Text color. The default value is system specific. highlightbackground Together with highlightcolor and highlightthickness, this option controls how to draw the highlight region. justify Defines how to align multiple lines of text. Use LEFT, RIGHT, or CENTER. Note that to position the text inside the widget, use the anchor option. Default is LEFT. padx Horizontal padding. Default is -1 (no padding). pady Vertical padding. Default is -1 (no padding). relief Border decoration. The default is FLAT. Other possible values are SUNKEN, RAISED, GROOVE, and RIDGE. takefocus If true, the widget accepts input focus. The default is false. textvariable Associates a Tkinter variable with the message, which is usually a StringVar. If the variable is changed, the message text is updated. width Widget width given in character units. A suitable width based on the aspect setting is automatically chosen, if this option is not given.